Need to give a presentation? Or an on-air interview? Doing a podcast? A pep talk for your emplyees? Storytelling in front of an audience? Then Toastmasters Cub is a the place to practice and be supported by people who are doing the same. In no time at all you'll be confidant in any public situation. Visitors will be able to observe a Toastmaster meeting in action, with explanations along the way as to what is happening and why. 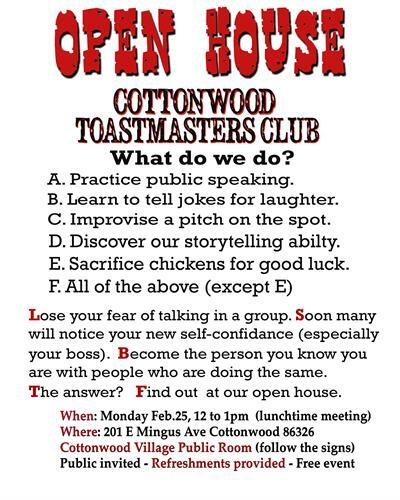 The public is invited to attend a Cottonwood Toastmasters Open House, Monday, February 25, 12:00 –1:00 PM, Lunchtime meeting at Cottonwood Village, 201 E. Mingus Ave., Cottonwood, Community Room. Follow the signs. Refreshments will be served. Open to the Public, no admission.